Penn State women’s lacrosse (17-3) is heading to its second straight NCAA semifinals after a 14-12 win over Princeton Sunday at Penn State Lacrosse Field. Head coach Missy Doherty will face her alma mater, No. 1 seed Maryland, on Friday at Gillette Stadium in Foxborough, Mass. Sophomore Madison Carter put Penn State on the board first before Maria Auth gave the Nittany Lions a 2-0 advantage over the Tigers less than three minutes into the game. Princeton would rally to tie things up at 2-2. Senior goalie Cat Rainone made a tremendous between-the-legs save to keep Princeton from taking the lead, then Auth charged down the field and netted her second of the afternoon to make it 3-2. Auth put a bow on her hat trick just over 13 minutes into the first half on a free-position goal, but the Tigers would claw back again to tie it 4-4. 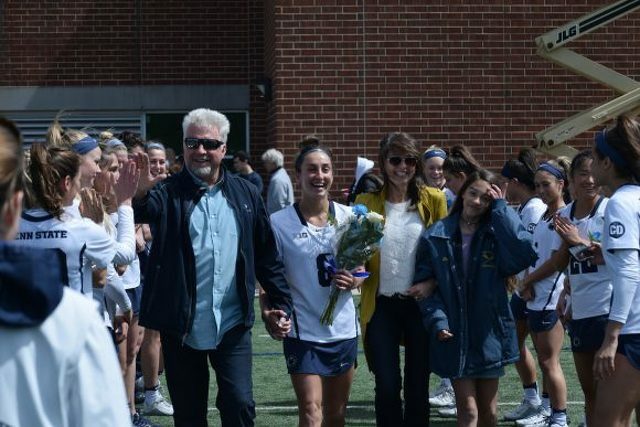 First team All-Big Ten midfielder Katie O’Donnell went down hard in front of the Penn State net midway through the half, but after getting some treatment, she hustled back onto the field. Taylor Bleistein put Penn State back on top, 5-4, then Rainone made another juggling save to keep it that way. Princeton drew even with the Nittany Lions with 2:11 left before the break, but Maggie Gallagher’s first goal of the game gave Penn State a 6-5 lead heading into the intermission. The Tigers stormed out to two quick goals and their first lead of the afternoon, 7-6, just over a minute into the second half. Carter tied Marsha Florio’s 1983 program record for goals in a sophomore season with her 68th of the year, then O’Donnell ripped one past Princeton goalie Ellie DeGarmo to help Penn State retake the lead, 8-7. Princeton had a goal called off due to a yellow card on Olivia Hompe, but would score with a man down then tally another to go up 9-8. O’Donnell unloaded a sideways shot for her second goal of the game to tie things yet again with 19:43 to play. Carter finished off the hat trick with a nifty spin move, breaking Florio’s mark while giving the Nittany Lions a 10-9 lead. Princeton would score two quick goals to regain the advantage, though. Senior midfielder Abby Smucker’s free-position tally prompted a timeout with the score tied at 11. Princeton took the lead, 12-11, with 5:56 left but Auth broke a Tiger defender’s ankles with a nasty juke to score her fourth goal of the game 36 seconds later. Elizabeth George was soon handed a yellow card, allowing Kayla Brisolari to score a man-up goal and make it 13-12 Nittany Lions. O’Donnell added an insurance goal to complete her hat trick and seal the victory. The Street, Md., native finished with a career-high five points in the win, including four goals. The Nittany Lions will face No. 1 seed Maryland in the Final Four this Friday at 5 p.m. in Gillette Stadium. 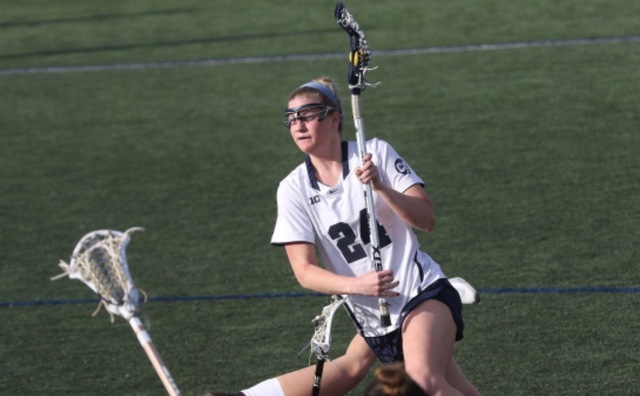 Patrolling Penn State’s defensive third the past five years, Erika Spilker has had quite a vantage point for the resurgence of Nittany Lion women’s lacrosse.